Hi, Matt Killian here at your service! 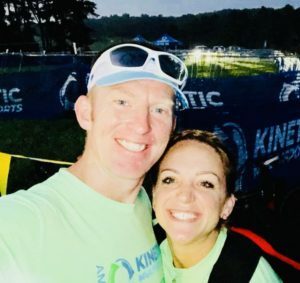 I absolutely love the sport of Triathlon and I’d like to welcome you to Kinetic Multisports! I’ve smashed over 40 Tri’s ranging from Sprint, Olympic, HIM, and 5 Ironman races. (25 of those have been Kinetic Races) I know full well how it feels to step into the sport and how much is involved, so it’s an absolute pleasure to serve as an Ambassador for Kinetic. I’m here for you! Ask questions, leave no stone unturned, the Kinetic Ambassadors and I have so much knowledge to share. As a United States Marine, I absolutely love how Kinetic embraces the military community and makes everyone feel like family. Come and jump into the mix! My beautiful wife Kree and I will see you at the next Kinetic Race!! Remember- Courage will get you to the Start Line, Heart will get you to the Finish Line, all you have to do is Tri.